Pancakes, flat jacks, hotcakes…no matter what you call them they’re delicious. If you disagree, message me and we can have a pank doo (pancake) debate. If I do find a non-pancake lover, I’d have the right mind to slap them across the face with one (like on the movie Grown-ups). For those of you that are in agreement with my love of pancakes, here’s a dip your toe in the raw water recipe of deliciousness. I got this recipe from Brendan Brazier’s book Thrive. It’s a great book for athletes and non-athletes alike. Vegans, health-nuts, and just people trying to be healthier can get some great ideas from it. While Brendan’s recipe calls for buckwheat flour, I use whatever is on hand. I would suggest keeping to a gluten-free flour, in order to keep these light on the stomach and easy to digest. If you’re a brave raw foodist you can, like me, first sprout the buckwheat, or other grain. Then dehydrate until crunchy. Next grind in your food processor to desired consistency. Now you have raw, sprouted, living flour! Because this is such a process that takes several days, I do a big batch at a time and store it in the freezer. The steps are REALLY easy, it just takes a bit of planning. Probably a total of ten minutes actual work time. If you don’t have a dehydrator, the time, or simply the gumption, start out with buckwheat, quinoa, or even almond flour. Other fruit, like berries. Blueberries, strawberries, raspberries, cherries, blackberries, or dingle-berries (I don’t know what those actually are). If it’s berriesque it belongs in the pancakes! 1. Stir together the flour, flaxseed, hemp protein, baking powder, and cinnamon until they seem like one. 2. In a food processor blend the banana a some of the water until smooth. 4. 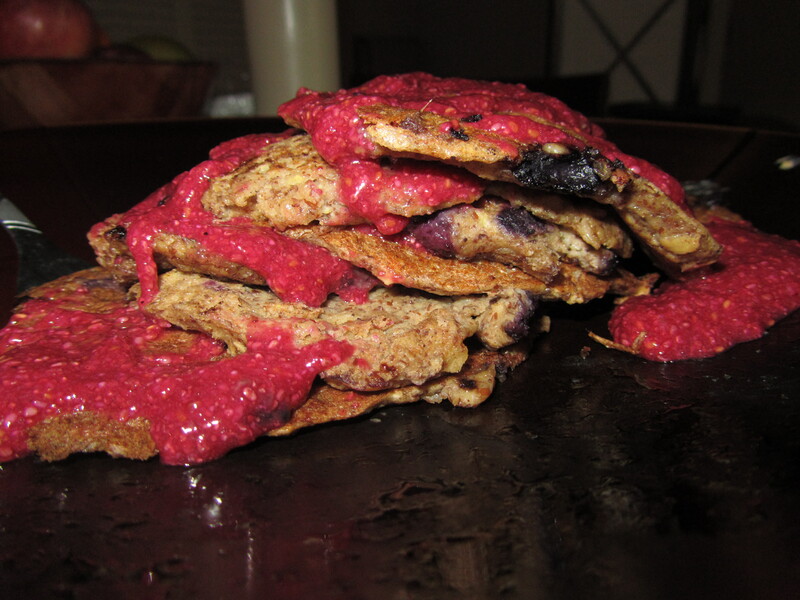 Mix in the berries and oat flakes, and whatever else you want. 5. Now here’s where there’s a fork in the road. You can a) dehydrate the pancakes on low or b) heat them on VERY low over the stove in a pan. Of course dehydration will take a…while. If you prefer to heat over the stove, but still want most of your food living, just be sure to keep the heat very low. The pancakes should get firm on each side after sitting about five minutes. The center will be moist and undercooked, but delicious none-the-less. Now every good pancake has to have a delicious topping. You can do the ever so over done maple syrup or agave nectar, honey if you desire. In my opinion though, this raspberry topping I made for Todd really completes it. 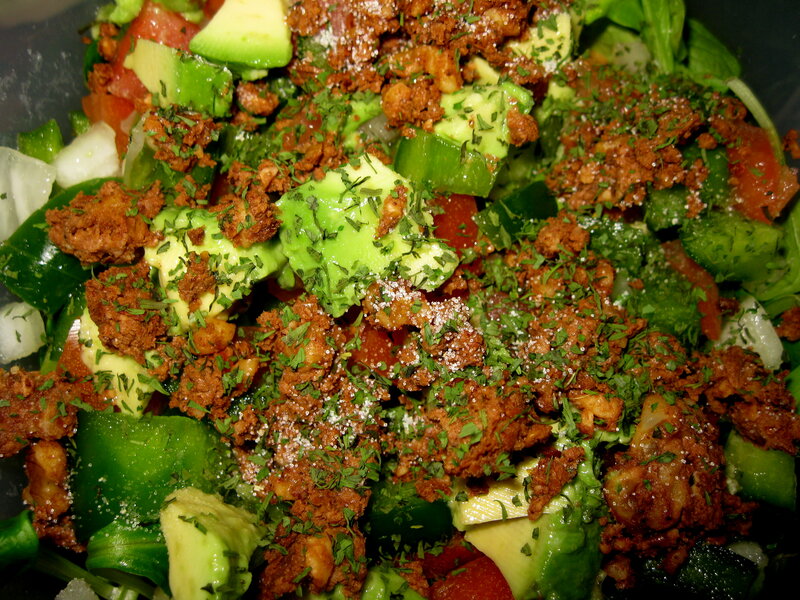 Blend everything together in a coffee grinder or food processor. Throw it on top of your pancakes. Now, I’m no expert, but the sweetness and fun color of this topping seems like a great way to introduce kids to raw pancakes. I was recently at a grocery store and was told by an acquaintance to buy the corn because it was on sale. When I pointed out it wasn’t organic she made a face. So then I mentioned if it’s not organic it’s GMO corn. She made another face. I said “genetically modified organisms” to clarify. She made another face and declared “well I’ve been eating it my whole life and I’m fine!” and trotted away. Had I the chance…and attitude…I would have said “no, no you haven’t had it your whole life.” GMOs are as recent as the 80s and only began to widely be used in the mid 90s. What are GMO’s? GMO stands for genetically modified organisms(eeew sounds sciency). Basically it’s science’s way of making what we already eat better. Better for who? Better in what way? Well for one thing to keep more bugs away GMO crops are used by farmers. The two most popular GMO crops are corn and soy. So what’s wrong with that? Well in several studies when these foods were fed to mice and cows the animals suffered disease. Namely liver and kidney disease. Infertility is another potential side effect. Impotence another possible effect, that’s right guys, IMPOTENCE. Even if studies had not been done, I prefer to be a guinea pig while the verdict is out. There are plenty of hungry and eager Americans raising their hand to volunteer their health. I know it’s not possible for many people to eat 100% organic 100% of the time…I haven’t reached that ability yet. But the least we can do, once educated is avoid food that comes close to not being….well food. If you read more about GMO’s you’ll learn they can get a gene from anywhere and insert it into anything. Tomatoes with pig genes anyone??? It doesn’t have a lot of frills, very “textbooky” about the way it explains the history of GMOs. After watching this even if I didn’t care about GMOs or my health, I wouldn’t want to support Monsanto. A huge, dirty, and conniving company. Let’s celebrate the fact that we still have access to organic non-gmo corn with a recipe. 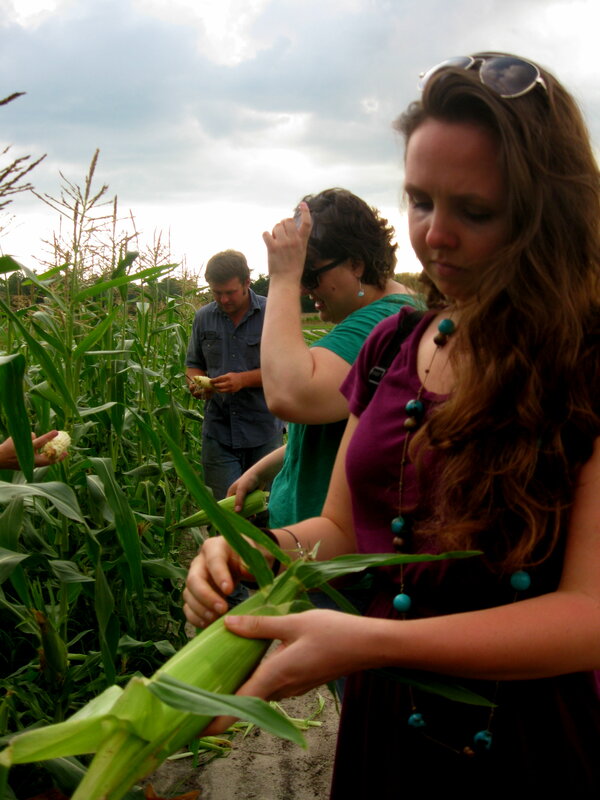 Of course you can enjoy corn fresh off the cob, which is what we did at my cousin’s organic farm. As you can see I’m quite serious about the whole operation. I smiled once I bit into it. : ) Yuuum. Throw everything but flax in a food processor, process until smooth-ish. Add flax and either mix in food processor or by hand if you’re feeling ambitious (I wasn’t). Cover dehydrator trays with paraflex sheets and spread the corn chip batter evenly with a spoon. Dehydrate at 105 F for 1.5-2 hours, turn over onto mesh trays. Use a knife to score the shape of the chips and continue dehydrating overnight. Store in airtight containers. NOTE: Makes two trays. I made my chips super thin, under a clearly misguided understanding of how thick corn chips are. And it barely made two trays in my dehydrator. So, you may want to increase the ingredients and make them a bit thicker, especially if you’re going to do a nacho plate thing and pile stuff on top of them. Mmmm nachos…. Well, I’m off to enjoy life.